On Nov. 5, the CEO of Pacific Gas & Electric told stock holders she would renew the drive to change a California state policy called "inverse condemnation," which holds utilities responsible for any damage done by their equipment even if they have done nothing intentionally wrong. On Nov. 8, the deadly fires that have killed dozens of people and devoured large swaths of the Golden State erupted — and suspicion quickly fell on PG&E's equipment. That Geisha Williams, who heads California’s biggest power company, would try to weaken inverse condemnation did not surprise Patrick McCallum, who leads a group of 2017 fire survivors called Up From The Ashes — and who nearly died with his wife when their house in the state’s wine country was reduced to ashes by a wildfire. "The oil companies back PG&E, big time investors are backing PG&E," McCallum told NBC News on Tuesday. "There is a powerful coalition backing them in this fight." 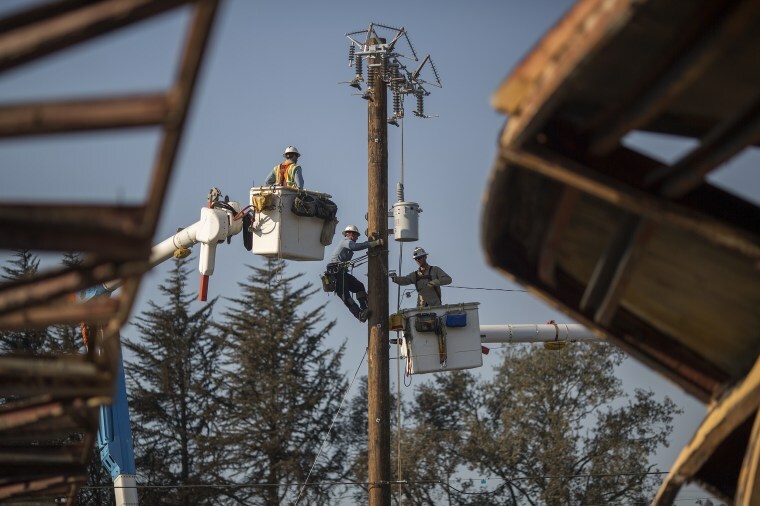 But with the horror from the November infernos growing and a new governor taking over in January, McCallum is hopeful that PG&E’s latest attempt to get the state off its back will fail. Governor-elect Gavin Newsome has “indicated a fairly thoughtful approach to this and we’re pretty optimistic he will come up with a thoughtful solution to keep Californians safe," he said. State officials have not yet determined the cause of this month’s deadly blazes, but already investigators are looking at a possible PG&E electrical transmission line malfunction for sparking the fire the destroyed the town of Paradise. If that turns out to the be case, PG&E could face massive lawsuits on top of the 200 or so the utility is already contending with from the deadly 2017 fires. The California Department of Forestry and Fire Protection blamed PG&E equipment for starting at least 16 of those fires last year. And they could cost the utility up to an estimate $15 billion in damages, according to published reports. NBC News reached out repeatedly to PG&E for comment and there was no immediate response. But this year, the utility has already spent at least a million dollars on lobbying, according to the Open Secrets databases. And San Francisco-based PG&E is not the only utility in California that has been trying to influence lawmakers in the aftermath of last year’s wildfires — and before the burning began this year. Electric utilities in California as a whole spent heavily on state lobbying and campaign contributions this year as of Oct. 24, Open Secrets reported. Among them, Southern California Edison reported $900,000 in lobbying payments from April through June, and Sempra Energy disclosed $502,000 in lobbying fees for the same period, according to the Sacramento Bee newspaper. PG&E caught a break in September when Gov. Jerry Brown signed sweeping legislation aimed at fighting California wildfires which, among other things, eased the burden for the utility by allowing it to tap customers for a portion of the costs from the 2017 fires. Brown inked the legislation after PG&E reportedly spent millions lobbying state officials. Critics like Mark Toney of The Utility Reform Network blasted the bill as a bailout for PG&E. “We think that policy makers need to stand up to Wall Street blackmail and represent the interests of California customers over investor profits,” he told the Mercury News in September. But Brown defended the legislation as necessary. McCallum said PG&E has a “horrible safety record” and should not be rewarded by further loosening rules so they can escape from their responsibilities. "We think we have something in place that will force them to be safer, and make decisions that will be safer for all Californians," he said.